Over the past month or so, I've heard weird creaks from my left crankarm on the Raleigh Wayfarer. Not only that, the pedal made a noticeable "slip" feeling with each pedal stroke. I didn't think too much of it until the sound became worse. I asked some bike experts, and though I thought the issue was with the crankarm they thought it was the pedals because that's what's usually the problem. Nine times out of ten. Yep, it was the crank after all. Thankfully, I was on a sidewalk stopping at a cafe when this happened. It could have been more disastrous a few seconds earlier when I was crossing the busy street to get to said cafe. And thankfully I didn't hurt myself. But of course, I always feel stupid when stuff like this happens. I've already broken the frame on the Wayfarer, so this is another break to check off. 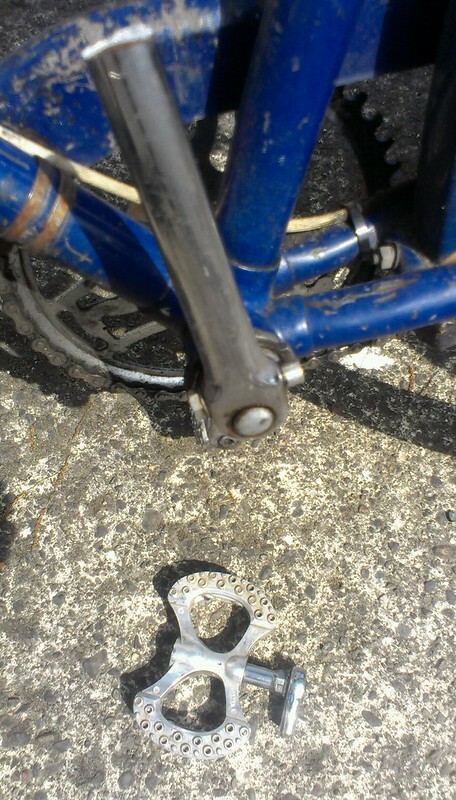 And this ain't the first time I've ever broken a crank (or a frame, for that matter.) Heck, I've even broken handlebars before! Thankfully crank replacement isn't as big of a deal as a broken frame. But I have to find a replacement first. So if anyone has a Raliegh branded cottered crank, left side, 165 mm, and would like to part with it, get in touch. Before reading I looked at the picture and thought "Ooooh by... I hope that didn't happen while he was riding... fast... far from home... on a busy street...!?" It would definitely be scary if it snapped at speed, etc. It still is a very real possibility, but when you think about it: The most force you put on a pedal is when you start up, so this is when it would be most likely to break. (Same thing with handlebars, which is what happened to me.) I'm no materials scientist, but this is my uneducated answer. Nice! Steel crank to boot. You are a parts and frame destroying monster cyclist. Congrats! Bike parts companies: Send me freebies so I can thoroughly "test" your products. Ouch! That's impressive! I had been chasing a similar issue on the left side, but (luckily) found that it was some stripped out threading on the left pedal spindle. Little bit 'o thread lock to hold the lock nut in place and all seems fine. Good luck in your crank arm search! Weird, I know another person who broke a crank probably the day before you did. He didn't walk away unscathed, unfortunately. Crankarm failure, so scary. Did you get a good shot of the cross-section where the crankarm broke through? It would be interesting to see, from a failure-analysis perspective. 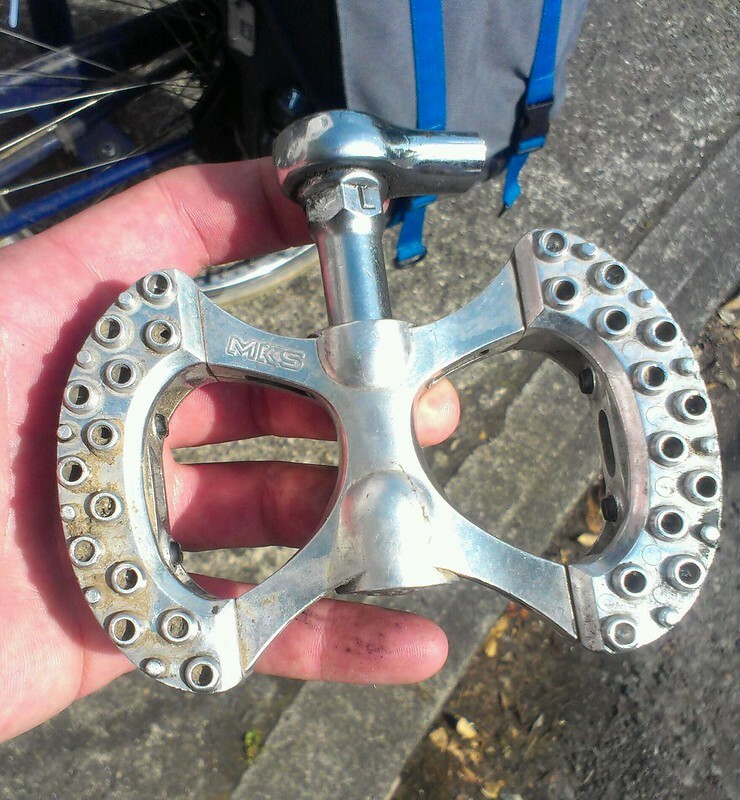 Also, I'd ask if you knew if this crankarm had been bent or re-bent at any point. Rodney- I may have a better photo, I shall see. If anything I'll take a better photo when it comes back from the shop. (I found a suitable replacement and it's getting put on the Wayfarer.) I have no idea if the crankarm got bent at some point. This is the risk one runs with getting used bikes about 40 years old.